The Magician represents strength of will, creative talents and organizational skills. How many of us pledged to undertake creative endeavors, get organized, and be determined and steadfast in our resolutions this year? I know those are some of my resolutions, and here we are, nearly at the end of the year. How much did I accomplish? The Magician’s gift is the ability to connect power, strength and energy from above with the earth-bound mundane – the uniting of Spirit with Mind and Body. 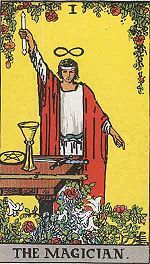 As we saw in Key 0, The Fool, The Magician also wears red and white, and is surrounded by red and white flowers, representing the merging of desire, action and passion with abstract thought and purity. On the altar are representations of the four suits of the Minor Arcana (Wands, Swords, Cups, Pentacles) which represent Fire, Air, Water and Earth, respectively. It is in balancing the energies of these elements that we find balance in our lives. Two symbols in The Magician key represent eternal life – the lemniscate above The Magician’s head, and the Ouroboros (the Snake devouring its tail) around the waist. These symbols remind us that there is never an end to the Eternal connection with the Divine. The Magician’s right hand holds a wand, reaching toward heaven, while the left hand points to Earth, reminding us that we need to stay connected to both Spirit and Earth as we move through our life’s journey. The Magician Key is the first lesson in The Fool’s path to enlightenment: self-awareness comes only when we are connected to Spirit and live in balance.
! there… You have both my finish n some info about a teeny glitch on my last try. I tried to delete n correct this time n all worked fine! … Who knows!?! Congratulations on your scrumptious new website! I met u at a workshop at McKay healing arts 2-3 years ago. I would like to have a Tarot reading and consult with you in person. Do you do such in-person? And where? Your new opportunities for growth sound wonderful!